December 25, 2018. Bodhgaya, Bihar, India – There was a chill in the air yet the sky was bright as His Holiness the Dalai Lama walked from Gaden Phelgyeling Monastery to the Kalachakra Ground this morning. He waved to people who had gathered to see him on the road outside and inside the ground. He shook hands with people kneeling on the edge of the stage and walked to the northern side to wave to people from abroad. He saluted the images of enlightenment at the back of the Kalachakra pavilion and took his seat on the throne. Among the eminent Lamas sitting to the left before the throne are the Ganden Tri Rinpoché, Ganden Trisur Rinpoché, Jangling Tulku from Bhutan, the Sharpa and Jangtsé Chöjés and to the right the 42nd Sakya Trizin, Ratna Vajra Rinpoché, and his brother Gyana Vajra Rinpoché. Also seated near to the throne are scholars, Abbots and Tulkus. Theravada monks from South and South-east Asian countries first recited the Mangala Sutta http://www.sangye.it/altro/?p=1868 in Pali. Next a Korean group chanted the ‘Heart Sutra’ http://www.sangye.it/altro/?p=8419 in Korean to the steady beat of a wooden fish gong, a ‘moktak’ that symbolises alertness. A group of Vietnamese followed, chanting the ‘Heart Sutra’ again in their language, to the rhythm of a smaller, higher pitched wooden fish gong. 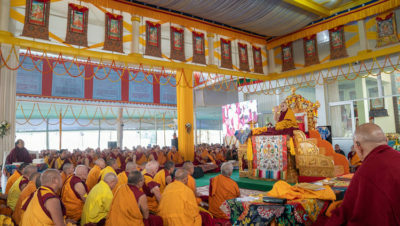 His Holiness opened his remarks with a quotation from Tsongkhapa http://www.sangye.it/altro/?cat=22 “At the end of the ‘Great Exposition of the Stages of the Path’ he writes, ‘May I light the lamp of compassion to illuminate the Dharma in lands where it has not appeared, and in others where it has spread and declined’. In some countries that have a common tradition of reciting the ‘Heart Sutra’, but did not take up the Nalanda Tradition of rigorous study, we can hope to revive the Dharma. Countries in the West are places to which Buddhism had not spread, but where there is now a great deal of interest in what the Buddha taught. I am cautious about teaching Buddhism in places that belong to a Judeo-Christian culture, but am more comfortable teaching the Dharma to people from Asia where Buddhism is an established tradition. His Holiness resumed his reading of the ‘37 Practices of Bodhisattvas’ http://www.sangye.it/altro/?p=1727 with verse 7 which mentions taking refuge in the Three Jewels. He explained that the actual refuge is true cessation and the true path. We need someone to show us that, so the Buddha is for us a teacher. What we have to do is practise what he taught. When we come across difficulties, members of the Sangha set an example and give us support. The next verse refers to suffering. His Holiness outlined the three kinds—suffering of suffering, suffering of change and suffering of pervasive conditioning. Suffering, he said, is the direct result of karma and disturbing emotions, but is ultimately rooted in ignorance. Verse 9 notes that all the pleasures of cyclic existence are transient and impermanent like dew on the tip of a blade of grass. Liberation, however, is unchanging and is attained by overcoming ignorance. The illusory spectacles of a deceiving magician are there. Making your attention unforgetful, maintain it within appearance and emptiness. His Holiness added that even when we know, as a result of analysis, that things don’t exist as they appear, they still seem to have a solid, self-sufficient existence. Meanwhile, quantum physics says nothing has any objective existence. The mind, which is free from fabricated extremes, exists as a continuum of moments of consciousness. This is what memory depends on. The text counsels giving up attachment and regarding all forms of suffering as like a child’s death in a dream. The next six verses, 24-30, deal with the six perfections. His Holiness commented on verse 31 that if you don’t check within yourself, you might have the appearance of a practitioner, while actually only being a hypocrite. He remarked that there is no separate chapter in the ‘Guide’ about ethics, but in order to observe ethics purely you need conscientiousness and introspection. Reaching the end of the text, His Holiness read the concluding verses added to his Tibetan edition by Lhatsun Dorjechang. Next, His Holiness explained that he was going to lead the ceremony for generating the awakening mind and taking the bodhisattva vows that he would have saved until the empowerment tomorrow. Prior to that, in order to contribute to the four-fold circle of Sangha consisting of monks, nuns and lay-men and women, he would give the lay-person’s precepts. “Even if people don’t have genuine bodhichitta, nor even the simulation of an awakening mind, but at least have faith and confidence in it, they’ll have the most basic qualification for entering into the tantric path. I’m going to give this ceremony on the basis of Je Tsongkhapa’s ‘Basic Path of Bodhisattva Ethics’ that he modelled on Asanga’s ‘Grounds of Bodhisattvas’. Having completed the ceremony for generating the awakening mind and giving the bodhisattva vows His Holiness stated that there is no better way to create merit, purify misdeeds or bring benefit to others. He recited verses from Chapter 3 of the ‘Guide’. And now am one of Buddha’s Sons. “The main point you should keep in mind after taking the bodhisattva vows,” His Holiness advised, “is henceforth to avoid a selfish motivation. You should also avoid carelessly revealing to others, who may not appreciate it, that you have taken these vows. The point is that Dignaga was directly encouraged by Manjushri. After his celebrated victory in debate over the brahmin named Sudurjaya at Nalanda, his opponent through miraculous power released a blaze of fire from his mouth that singed Dignaga’s robes. Disheartened Dignaga threw a slate up in the air saying, “When it hits the ground I’ll give up my aspiration to enlightenment.” But the slate never landed and when he looked up he saw that Manjushri had caught it and gave him encouragement. 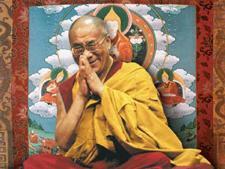 His Holiness read and discussed the opening apparatus of the book, the verse of salutation and the promise to compose. He repeated Khunu Lama Rinpoché’s interpretation: “Although I do not have a thought to benefit others, I wish to acquaint my mind with this…” His Holiness mentioned that he has received the transmission of several texts on logic and epistemology and hopes there will be time and opportunity for him to pass them on in Dharamsala. Tomorrow, His Holiness will give the Solitary Hero Vajrabhairava preparatory rites and empowerment.